There are 47 sites nationwide welcoming Experience Freedom guests who can keep their creature comforts close by when exploring the great outdoors. With many accommodation options to choose from, you can hire a motorhome, stay in a yurt, pod or iconic Airstream, or pack up the tent and camp in multiple sites set in stunning locations. New for 2019 glamping, the Brighton Club Site welcomes the addition of ten stylish glamping pods. Enjoy the best of the Sussex countryside, whilst overlooking the bright lights of the city of Brighton in this modern-take on camping. With comfy bedding, en-suite bathroom facilities and cooking equipment provided, guests have everything they need to make the most of their stay. Prices start from £69 per night for a minimum of two nights based on up to two adults and two children sharing. 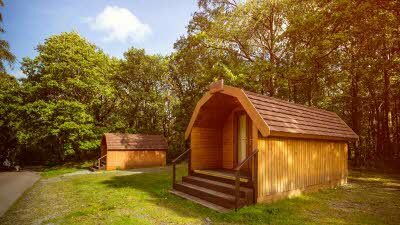 Glamping pods are also available in Moreton-in-Marsh in the Cotswolds, Coniston in the Lake District, Abbey Wood in London and Alderstead Heath in Surrey and for a glamping experience under canvas Daleacres in West Hythe, Kent offers spacious yurts. Check out the website Experience Freedom for dog friendly options and the full choice of glamping experiences on offer. Experience Freedom customers can now find out what freedom really feels like by getting on the road with motorhome hire. Through Experience Freedom’s partners, Swift Go, customers will be able to explore the country and see the UK's extraordinary landscape in a comfortable campervan or motorhome for up to five people. Customers can start their motorhome hire adventure from the centrally located depot in Manchester or from the new Scotland depot located just outside Edinburgh that will be open by June 2019. With Experience Freedom motorhome hire customers also get access to over 2,700 UK and European sites to stay on via the Caravan and Motorhome Club along with exclusive discounts on ferries. So whether they are planning to take their motorhome to Scotland, Cornwall, France or Spain, they will have even more choice of places to stay while you're on the road. Richard Smeaton, Swift Group Finance Director and head of Swift Go Motorhome Hire, said: “With Swift’s undoubted motorhome expertise and the Caravan and Motorhome Club’s experience, advice and support network, hirers can book with confidence – from seasoned tourers to try-before-you-buy customers. Harvey Alexander, director of marketing, the Caravan and Motorhome Club said: “We know the importance of spending time in the great outdoors, and Experience Freedom allows us to create outdoor adventures and offer them to everyone. People who don’t own their own unit, and may be a little nervous of the whole concept of camping, are now well catered for with our fantastic selection of pods, yurts and Airstreams. Alexander continued: “Motorhome hire, with our partner Swift Go, also provides holidaymakers with the opportunity to try their hand at motorhoming. Camping is also a huge element of the Experience Freedom brand and we offer excellent facilities at over 40 tent camping sites; enabling as many people as possible to enjoy the great outdoors and build lasting holiday memories”. For more information on Experience Freedom, please visit: www.experiencefreedom.co.uk. Experience Freedom from the Caravan and Motorhome Club provides luxury accommodation in some of the most beautiful locations in the UK. Experience Freedom offers a choice between modern, self-contained glamping pods, canvas yurts, wooden camping pods or tent camping at over 40 locations around the UK, plus a motorhome and Airstream hire scheme. Experience Freedom is operated by the Caravan and Motorhome Club, a membership organisation with a wealth of experience in operating high quality sites. Champions of the great outdoors, the Caravan and Motorhome Club represents the interests of over one million caravan, motorhome, campervan and trailer tent owners across the UK. Founded in 1907, the Caravan and Motorhome Club has a wealth of experience and prides itself on offering great value and high quality sites for tourers. The Club offers over 330 sites across Europe including France, Spain and Germany amongst other destinations. All members can take advantage of expert advice, overseas travel services, great ferry offers, cover and insurance and exclusive member offers and discounts. For further information about becoming a member of the Caravan and Motorhome Club, please visit www.camc.com or call 01342 318 813.